An international grocery chain has accidentally posted an internal memo in a very public place. UK grocery chain Sainsbury’s has accidentally placed a private internal marketing memo in a very public place: hanging up in the front window for all customers to see. 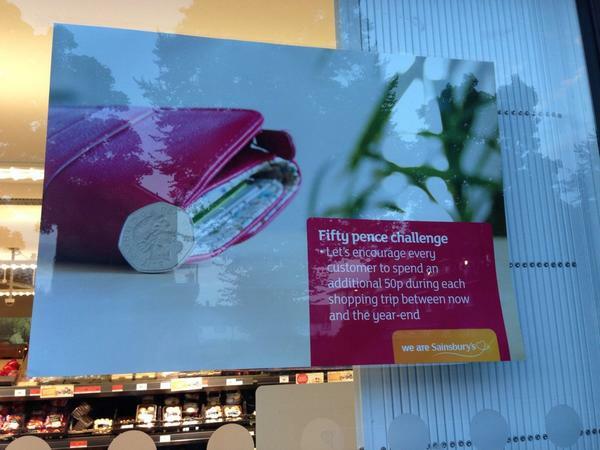 “Let’s encourage every customer to spend an additional 50p during each shopping trip between now and year-end,” the poster, meant for internal staff only, reads. The situation quickly gathered steam on social media, with the hashtag #50pChallenge taking off as the poster went viral. The timing isn’t ideal for Sainsbury’s, which is facing a “perfect storm” of problems, including a recent slump in sales, according to CEO Mike Coupe. “It’s the most challenging I’ve ever seen the market in my 30 years in retail,” Coupe said.